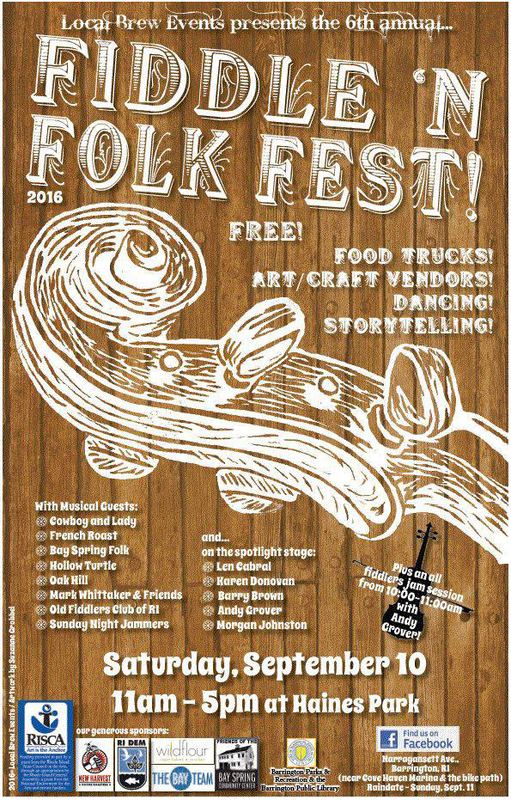 Local Brew Events’ 6th annual Fiddle ‘n Folk Fest! in Haines Park, Barrington RI (near Cove Haven Marina). Bay Spring Folk, Old Fiddlers Club of RI, as well as storytelling by Len Cabral, food trucks, craft vendors, dancing, and kids activities, it’s bound to be a rousing event. Join the all-levels fiddle jam with Andy Grover from 10:00- 11:00 am. Bring a chair and a blanket and enjoy the day overlooking Narragansett Bay. The day’s events are FREE, thanks to generous support from RI State Council on the Arts, the Town of Barrington Recreation Department, Barrington Public Library, The Bay Team, Friends of the Bay Spring Community Center, New Harvest Coffee, Wildflour Vegan Bakery, RIDEM, and many generous individuals. A rain date is set for September 11. View the festival flyer HERE. For more information go to facebook.com/FiddleNFolkFest.